Gaither M. Keener (’77), chief legal officer of Lowe’s Companies Inc., is the recipient of the 2012 Professional Achievement Award from Western Carolina University. Keener, a veteran of the U.S. Marines, is active in veterans affairs, providing pro bono counsel to a veterans organization and traveling to Washington and Raleigh to seek additional funding for veterans. He also is the judge advocate for the American Legion Department of North Carolina and is a senior member of the national American Legion finance committee. In 2010, Keener and his wife, Beverly Bogle Keener, endowed a scholarship to support one WCU track or cross country distance runner each year in recognition of the late Terry Helms, Keener’s college roommate at WCU and longtime friend, and Keener recently announced his intention to endow another scholarship, this one for education students named in honor of former WCU professors. Keener is active in his community in a number of volunteer capacities. He has served as assistant national director for the American Legion Little World Series and director of the Wilkes County Youth Baseball League and spent decades as a coach of community baseball and YMCA teams. 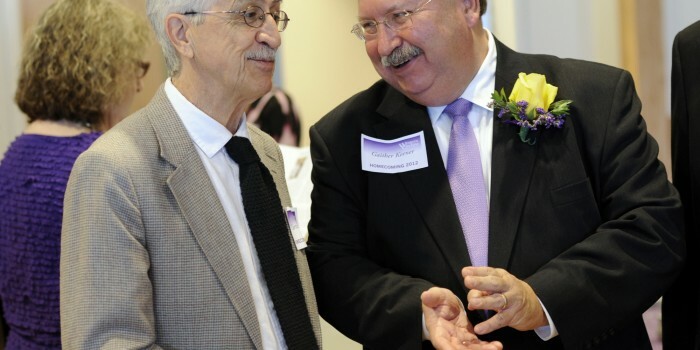 He served with the nonprofit Wilkes Health Foundation and on the board of the Wilkes Regional Medical Center. Keener is a member of the Order of the Long Leaf Pine, the state’s highest civilian honor, presented by the governor of North Carolina to individuals with a record of extraordinary service to the state. Also receiving university awards were the following WCU alumni: Bob Buckner, WCU’s former director of athletic bands, recipient of the Distinguished Service Award; Ronald G. Morrow, chief executive officer of the nonprofit North Carolina In-school Prevention of Obesity and Disease Inc., recipient of the Academic Achievement Award; and Wade G. Livingston, an assistant professor in the department of leadership, counselor education, and human and organizational development at Clemson University, recipient of the Young Alumnus Award. “These awards recognize and honor four of WCU’s most distinguished and successful alumni, and they have all made us so very proud,” said Marty Ramsey, WCU director of alumni affairs.